At a time when Indian Apex court stood heavily on coalgate scam, Team India is going to play at a place connected with coal handling …. Cardiff Docks is a port in southern Cardiff, Wales. At its peak, the port was one of the largest dock systems in the world with a total quayage of almost 11 km (6.8 mi). Once the main port for the export of South Wales coal, the Port of Cardiff remains active in the import and export of containers, steel, forest products and dry and liquid bulks. 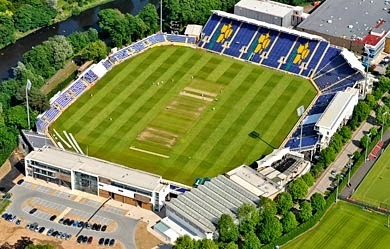 India desperate for a win is to play the 2nd ODI at the Glamorgan County Cricket Ground, or SWALEC Stadium as it is currently known under a naming rights deal, situate on the west bank of the River Taff in Cardiff. The park in which the stadium was constructed is Sophia Gardens, named after Lady Sophia Rawdon-Hastings. The park was acquired by Cardiff City Council, then the Cardiff Corporation, from the Marquis of Bute in 1947. Cardiff is the capital and largest city in Wales and the ninth largest city in the United Kingdom. Cardiff is a significant tourist centre and the most popular visitor destination in Wales. The city of Cardiff is the county town of the historic county of Glamorgan; a small town until the early 19th century, its prominence as a major port for the transport of coal following the arrival of industry in the region contributed to its rise as a major city. Indian skipper MS Dhoni’s declaration in Bristol that coach Duncan Fletcher would lead the team into next year’s World Cup has not gone down too well back home with the Board of Control for Cricket in India (BCCI). Along with coming down strong only Dhoni’s statement, where he also claimed on the eve of the first ODI that Fletcher ‘is still the boss’, the Indian board also tried to reinforce their status quo in terms of making high-profile decisions. While Fletcher’s contract runs up to the World Cup, his place at the helm of the Indian team’s affairs has come under intense scrutiny of late after Ravi Shastri was appointed as Director of Cricket for the limited-overs leg of the England tour. Glamorgan first played at Sophia Gardens against the Indian touring team in May 1967, but it was not until nearly three decades later that it officially became the county's home. The distance between Bristol and Cardiff is only 44 miles over the Severn Bridge (24 miles as the crow flies), which has led some to question the need for Bristol to have become England's tenth international ground. In 1968, Glamorgan’s spinner Malcolm Nash had his moment of infamy in a match against Nottinghamshire at Swansea. The ball allegedly used in the famous over was sold for a record £26,400 at Christie’s in London in 2006……….. those of us regularly following Cricket know it too well – in that match the poor spinner was torn apart by Garfield Sobers for six sixers in a over ……… later to be matched by Ravi Shastri, Herchelle Gibbs, Yuvraj Singh and Jordan Clark (Nash, Tilak Raj, Daan van Bunge, Stuart Broad and Gurman Randhawa – being the sufferers). A Cricinfo search reveals that apart from that 36 runs over to Gary Sobers, Nash was hit for five sixes and a four, by Frank Hayes of Lancashire and in his moment of glory he himself once hit four consecutive balls from Dennis Breakwell of Somerset for six.